We offer choices about the types of information you receive from us. 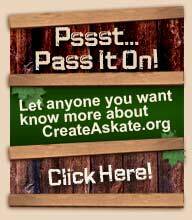 If you prefer not to receive catalogs or other communications from CreateAskate.org or if you prefer to receive them less frequently, please contact us at the address shown below. If you no longer wish to receive our Email Newsletter you also may contact us at the address below or unsubscribe using the link provided in each edition of the email. A cookie is a small data file that is stored by your Web browser on your computer. Cookies enable you to place an order on our Web site. They also allow us to enhance and personalize your online order experience, so that the information you receive is more relevant to you. We also use pixel tags  tiny graphic images  to tell us what parts of our Web site you have visited or to measure the effectiveness of any searches you may do on our site. Pixel tags also enable us to send you email in a format you can read and let us know when you have opened an email message from us. When you provide us your email address, we may send you emails necessary to process your order or respond to a request. For example, after you place an order at CreateAskate.org, you will receive an email confirmation and, in most cases, an email with package tracking information. Occasionally we provide links on our Web site to other sites we think you will enjoy. These sites operate independently of CreateAskate.org and have established their own privacy and security policies. For the best online experience, we strongly encourage you to review these policies at any site you visit. When you make a purchase or create an account on our Web site, your transactional information is transmitted in a safe, encrypted format. See About Security for details. Our Web site is not intended for use by children under the age of 12, and we do not knowingly collect personal information from children under the age of 12.